With this past weekend's release we added the ability to create calculations across screens. Now you can easily conduct calculations with fields that are all on different screens within your GoCanvas Apps. When you are choosing a field that you want to use in your Calculation you will see that ALL fields in your GoCanvas App that are eligible to use in a Calculation are available to you. They are broken up by screens so you can easily find the field you need. The screens appear in the same order that they do in your App. 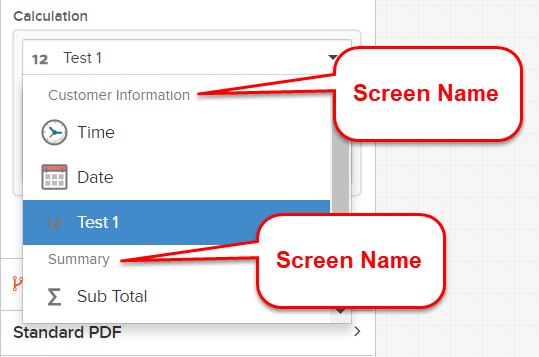 If a screen does not have fields on it that can be used in a Calculation then that screen will not appear. We hope this makes your lives easier when creating Calculations within your GoCanvas Apps! We did a bunch of other work during this release that will set us up for future enhancements. We will soon be launching an online community and we hope you all will participate! We did some work this past weekend that will allow our customers to seamlessly login to this community using their GoCanvas credentials. You will be able to ask questions, answer questions from other users, share amazing solutions you have created with GoCanvas, vote for new features and much more! Coming later in January 2018. When we survey our mobile users they often ask for features or enhancements that already exist in our platform. To help improve their experience out in the field we are adding the option for mobile users to send feedback right from their mobile device. The feedback will come to us and will go to the users on their account that have the role of "Admin". This allows us to lend a hand and help the Admin configure the GoCanvas App to meet the needs of the mobile users. Coming later in January 2018. Now that our website re-design has been completed, we are now optimizing our website for use on mobile phones or other smaller devices. One day down the road you could assign a GoCanvas App to a user from your mobile phone or add a new user or other functionality typically done via a computer/laptop. We'll keep you posted on this one. Let us know what you think! You can always send your thoughts about how we should improve the GoCanvas platform to feedback@gocanvas.com. Thank you for being our customer.